Discussion in 'Hardware' started by Angelv942, Aug 25, 2018. You don't use mechs do you? Heartsdelight and Angelv942 like this. Urulu, chrisswearingen4, b.m. and 8 others like this. Funny thing is i bought a mec pulse in a lot with a few other things maybe a week or 2 ago it was my first mech mod. I traded some juice and cash for a few things. What attracted me was the pulse i liked the rwg so much. So dummy me i didnt look over the pulse good at all the guy came and did the transaction at my job. I made a build that was .19 i was aiming for .21 .22 anyway i pull the mod out of the box to put the build on the bottle for the juice is missing and there was a huge crack right next to where you screw the rda on. Needless to say it was trash and ended up in the trash smh all this in the same 2 weeks the guy i got it from wont answer my calls i just chalk it up to karma you know i try my best to build as much good karma as possible. Those guys will recive the bad karma. Im very open to mech i would love to start building on one. Bro i really appreciate it but i would really like to send you something in return i do have an rda with a bf pin its just the drop was my baby lol i know its dumb but i loved it. Mykreign and Heartsdelight like this. If you get the rabbit mech squonker from @bx10r I’ll look in my stash for a bf rda for you tomorrow if you need one. MrMeowgi, Mykreign and bx10r like this. Ill send it monday...if hes gonna use it. Heartsdelight and MrMeowgi like this. Let me know if you need a bf rda. SteveS45, jcash74, MrMeowgi and 1 other person like this. Ok let me know if you change your mind. Not a problem. I know someone would do it for me. I've finally got to the point where I could help a small village if needed. Joeybear, Zander, eikceb.retrac and 4 others like this. Lol! I spy a Rainbow Pico Squeeze 2! Redbullque and MrMeowgi like this. Are you enjoying the Furyan? I just wouldn't feel good about myself lol. Maybe its a pride thing. 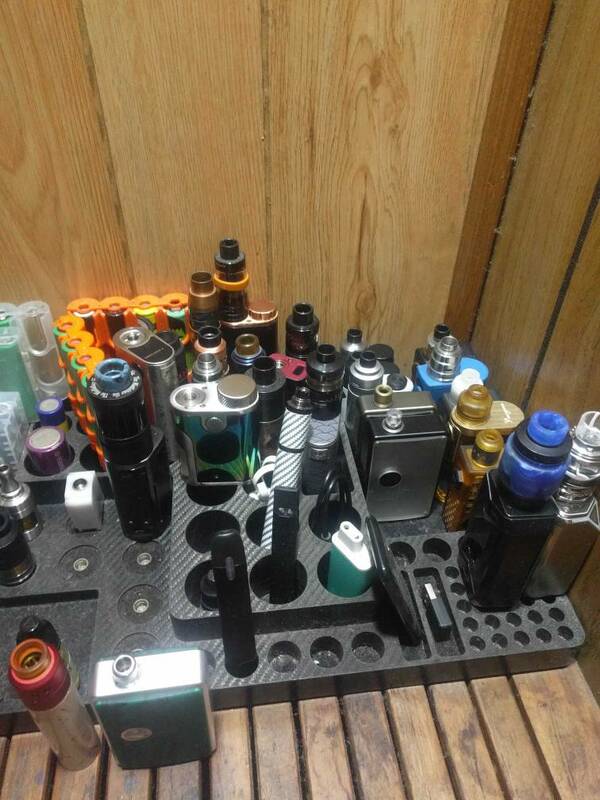 Do you use normal rdas i have a few maybe a trade for a bf of urs? I am. Honestly thought about selling it and another mod to get me close to paying for the starwars squonker @Jcash has for sale. I can't quit looking at it. My favorite starwars character to boot. Almost put my little orca up to fund it. Thanks, it's been ups and downs with it. Buy a ton and sell a ton. Like squonks. Had 17 sold 9 back to 14 now. Then I found billet boxes. OMG it never ends. Because then I finally took the plunge to diy. Lol they're great devices. Clones are a lot cheaper than the authentic. I've heard from authentic owners that there's not much difference in quality. And the new rev4 60 watts have a DNA chip and USB port. I have a silver with black accents drop RDA I'm not using. Let me know if you want it. Waiting on a coral 2 that will be here Monday. Not matchy in color but it's the kit. Wasn't looking for the kit but hey why not, right. Redbullque and Heartsdelight like this. Puneet Sharma, Heartsdelight and MrMeowgi like this. Ooo man j absoultly what would you want for it? Send me a PM with your address and it's yours. debinnv, ~Don~, Puneet Sharma and 3 others like this. Heartsdelight, jcash74 and MrMeowgi like this. Puneet Sharma and Heartsdelight like this. Heartsdelight and bx10r like this. I've been wanting to try a Squonk box mod! Who has one to trade? I have an authentic Apocalypse RDA, Goon RDA, Smok-E Mountain Vanilla mech mods, etc, etc, etc.... I'm flat broke too. I only get paid once every 4 to 6 weeks and my bring home for a month (part time) is about $480 dollars. After buying my medicine that my crappy Obamacare doesn't cover and paying my bills and rent it leaves me enough money to buy a bottle or two of ejuice. Yes I'm looking for a new job but the job market blows! Especially here in crappy Marietta, Georgia (USA). I don't know what all these news people ate talking about saying that the economy has improved dramatically since Trump but I don't see it! Everything is going sky high ($$$) thanks to the tariffs! Shoot! In 2005 I was making $18.75 an hour and working Full time! But here in 2018 I'm making $8.85 an hour doing the exact same work as I was doing in 05 and now I'm on part-time because no employers can afford Health Insurance after Obama screwed it up! And Nancy Pelosi saying about Obamacare... "WE HAVE TO PASS IT IN TO LAW TO FIND OUT WHAT'S IN IT"! LOL! What a crock! They knew what was in it. It was the same bill that was called "Hillary Care" back when Cigar Willie was POTUS! Both the Repubes and the Dumacratz are corrupt beyond belief! Vote Libertarian next time if you can and if you want to. Sorry about the political rate! I didn't mean to hijack this thread. No I don’t use rda’s but I would give you one of my bf rda’s. Id open a thread and post pics... you'll get offers depending on your items..
Zander, jcash74, MrMeowgi and 1 other person like this. Zander and Heartsdelight like this. jcash74, Heartsdelight and SteveS45 like this. It’s so nice that @jcash74 is sending you a Drop! It’s exactly what was stolen & is your favorite! I don’t have a Drop. So happy for you everything worked out. jcash74 and Heartsdelight like this. chrisswearingen4 and Heartsdelight like this. chrisswearingen4, Heartsdelight, MrMeowgi and 1 other person like this. chrisswearingen4 and bx10r like this. Drop had been "dropped" off at the post office. I pm'd you the tracking. gpjoe, chrisswearingen4, Heartsdelight and 1 other person like this. b.m., Heartsdelight and chrisswearingen4 like this. Whiskey, b.m., MrMeowgi and 6 others like this. So how's the stuff working out?